To book with Della, click here. or to see the full list of practitioners, click on the image above or here. PREBOOKING opens January 1st and closes January 22nd at 9 PM. Session are either $45 or $30 for 30 minutes. Cash Only. I am pleased to announce that I will be joining an amazing group of men and women at The Magical Winter Psychic Fair. I will be available for pre-bookings on Sunday, January 24th only, at the $45 for 30 minute rate (a huge saving over my private sessions). The event runs from 10:30 - 5:30 PM both days and starts with a FREE DEMONSTRATIONS & LECTURES from 10:30 – 11:00 am! 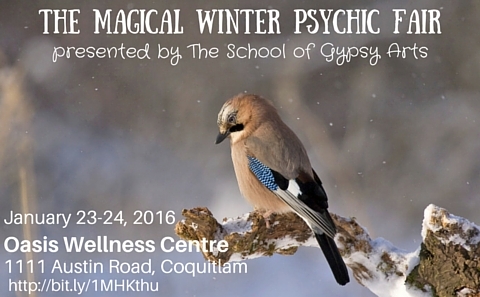 You can enter for a chance to win a 30 minute session with one of the practitioners at the upcoming Winter Psychic Fair. Receive a reading or a healing at the psychic fair and get a ballot to enter to win a gorgeous GIFT BASKET! Advance book a session with one or more of the practitioners or drop in on the day of the fair, as you will have 11 readers to choose from. This event sold out so quickly in November that we have added this to our February calendar. Book early to ensure your place! ​Do you have the yearning to bring the sacred teachings of animal medicine into your life to understand yourself and others? Are you drawn to a path that incorporates ancient knowledge and wisdom from different cultures & paths such as shamanism, paganism, and other traditions from around the world? Do you feel a deep and divine connection to all life on earth, including plants? If you have resonated in your heart space with the words above then "Earth Medicine: Animal Totems, Guides & Spirit" is a workshop that will empower and feed your soul. What Earth Medicine is and isn't! Develop your unique connection to animals without feeling like you are taking part in cultural appropriation. Learn to create and shape your connection from a soul level with animal totems, guides & spirits. The different types of animal allies that exist on earth and in the other realms, including mythical and extinct ones. How to journey and connect with animal spirits. What animal medicine is and what the significance is for you. Why embracing the shadow aspect of each animal is not only important, but powerful. How to incorporate the teachings and wisdom of your animal allies in your every day life to deepen your relationship and connection with your guides. The following list is a sampling of previous workshops. Any event may be scheduled upon request with a minimum of six participants. ​Click on the links below for content information.